Comments Off	| tags: Al Pacino, ArtFigures, DID, HeadPlay, Michael Corleone, Prison Break, Robert Knepper, The Godfather, Theodore 'T-Bag' Bagwell, Zhang Jizhong	| posted in Heads, What's new? I will start my countdown tomorrow. For today here’s one of the nominees who didn’t make it into the top ten. 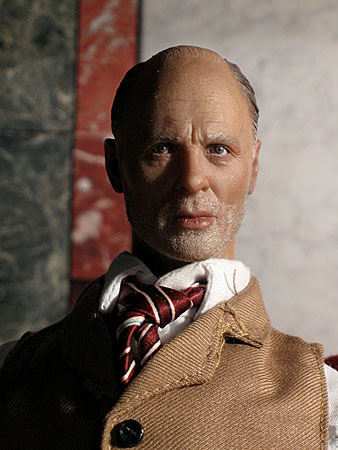 My # 11 is the Ed Harris head from DID. He already had his appearance in the last season of Memento Mori. I like the actor and the head sculpt and the paintjob are great. Look at the stubbles. 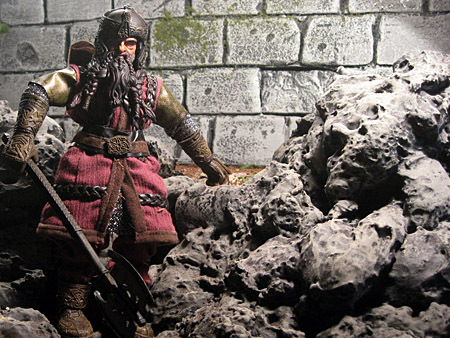 Here is the third part of my little Lord of the Rings shooting, starring Gimli from Toy Biz. This was one of the better Toy Biz head sculpts. For the first pictures I used some of my temple walls in the background. Then we see Gimli with his buddy Legolas on a DID horse and a little attack by a custom Orc. Over the year I took tons of pictures. On the weekend I did a little review and listed my favourite images of the year. I thought another countdown would be nice for this. So, here are the places 20 – 16. I hope you enjoy the pictures. Sometimes I’m tired of the multitude of military figures and kitbashes. And I’m not a fan of soldiers in heoric poses. 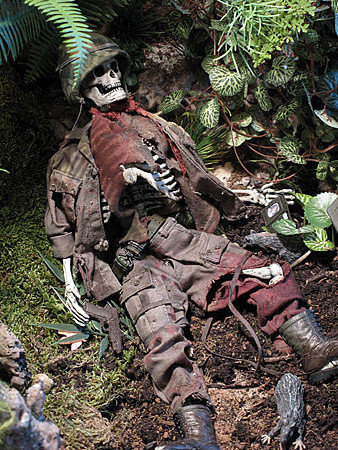 War is about agony and death. That brought me to this little concept work, showing a decayed GI in the jungle. I wanted, that the props – the rusty pistole and his wallet with a girl’s picture – tell a story. for the scene I created a little jungle location with a crashed helicopter in the trees. The skeleton is a repainted “Glow-In-The-Dark” skeleton. A very simple image, but I love it anyway. I like the light reflexes and blooming on the cornet and also the facial expression of the musician. 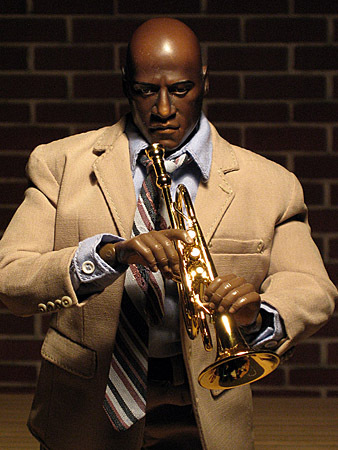 The picture reminds me on a Jazz musician and my visits on Bourbon Street, New Orleans. 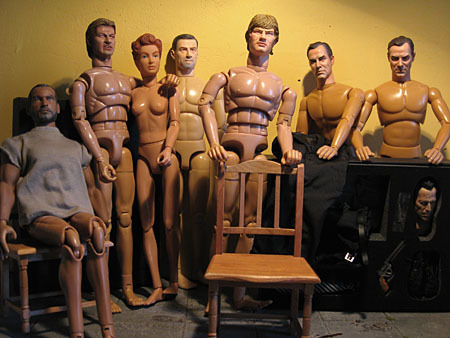 The series with my Robert Mitchum figure takes place in the “Old Fashioned Room” diorama. Outside I placed a poster with the skyline of New York. 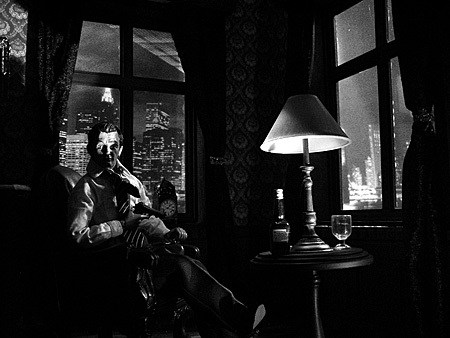 In order to get the desired Film noir ambience, I used a low key illumination and worked with hard contrast. The main light comes from outside the window and some mini spots lighten Mitchums face and the table. I like the shadows on his face and the details on the table. 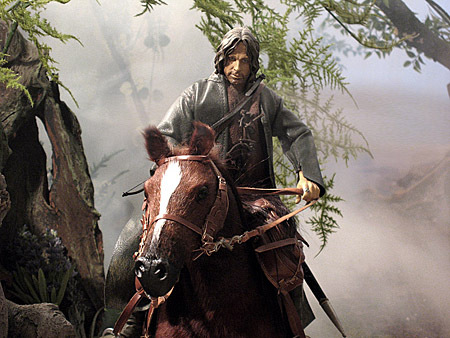 This is an image of the Sideshow figure Aragorn on a DID horse. It was shot in the “riverbed”. I blowed a lot of fog into the background. That makes a nice spooky forest. And I think there is a little illusion of motion in it. I like the blue back light here. And the air is full of cigarette smoke. 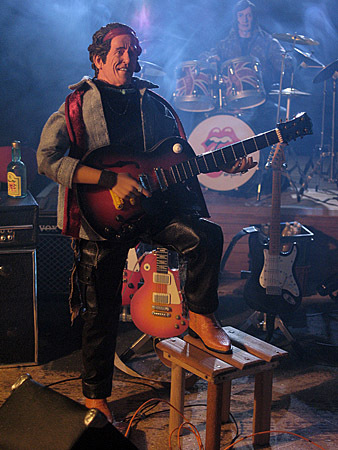 Only Charlie Watts in the background is much too young.